“Jews Say No” protest violates sanctity of 9/11 Museum ( vids & pics) | the "silent" majority no more! What follows are two of their flyers that claim to be ‘honoring’ those murdered by muslim terrorists on 9-11. 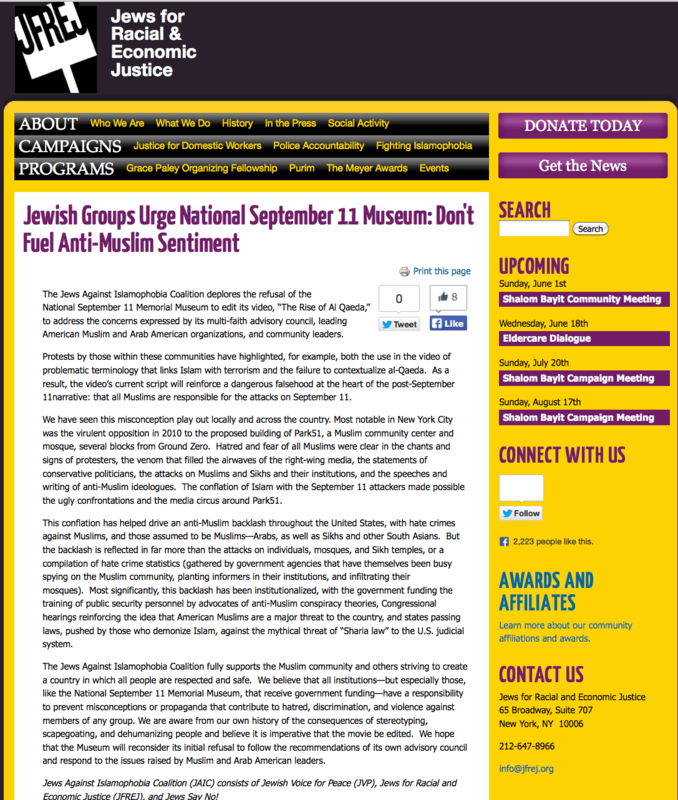 “The Jews Against Islamophobia Coalition’s silent vigil at the 9/11 Museum opening. This will be a silent vigil to hand out our leaflets to passers-by as they enter the Museum. Signs will be provided. 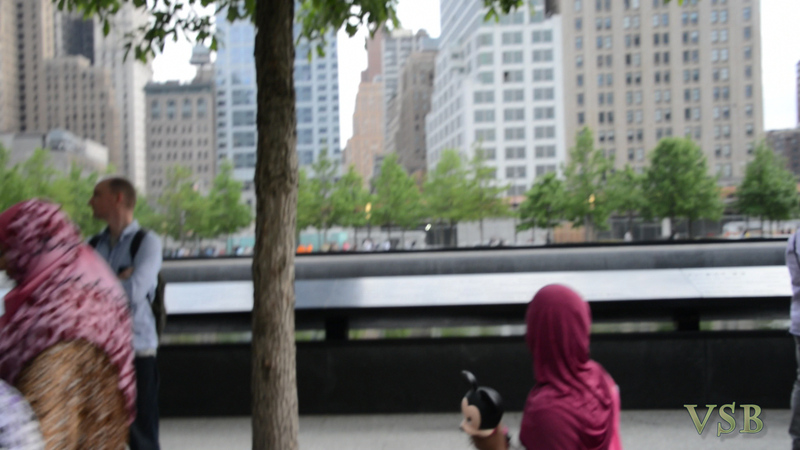 The flyers were to promote their ‘silent’ vigil and to demand that the “Rise of Al Qaeda” video be edited. Handed out by a group of about 40, split evenly between hard-core lefties (of retired age) …. regulars at the anti-Israel protests…. Standing in front of the Memorial Museum, I overheard one of Nevel’s minions express SHOCK, shock (! ), when the police officer told her the memorial grounds were private. That ‘debate’ about ownership was worth the price of a ticket. However, since the officer also said the owner was Port Authority, it begs the question, “Wouldn’t that make the museum PUBLIC property?” But, Donna Nevel would have NO quibbling. No debate. W hen she saw WHO was recording the exchange (moi)… This show was now off-limits . Donna Nevel, capo, had a “crisis” to fix.” Media opportunities” might be lost! (well…maybe not ALL media opportunities) If she could put my camera in chains, she would have done so. Some press is just not equal to others…. Then “Frick and Frick” (George and Friend) slivered out of the crowd to confront me. Insisting I identify myself. Tried intimidation with “telling the world where I lived”. Demanding to know WHY I was taking ‘their’ pictures (It’s a PUBLIC protest, George) Defeated, George and his friend returned to the herd moaning,” I don’t wanta be in YOUR camera” . It was all for show. Stand around. Look lost. Dismayed.” We have these “nice flyers”. Important flyers that the police won’t let us hand out. “People NEED this information” about the racist, anti-Muslim film being shown inside the Memorial. We must EDUCATE the People. For about 30 minutes they stood their ground between the entrance to the Memorial and the Memorial Falls. (they do know how to USE the moment) Gathering a crowd, cameras AND ( of course) HANDING OUT THE FLYERS anyway! This is how close they were to the Memorial Falls. A sacred place. 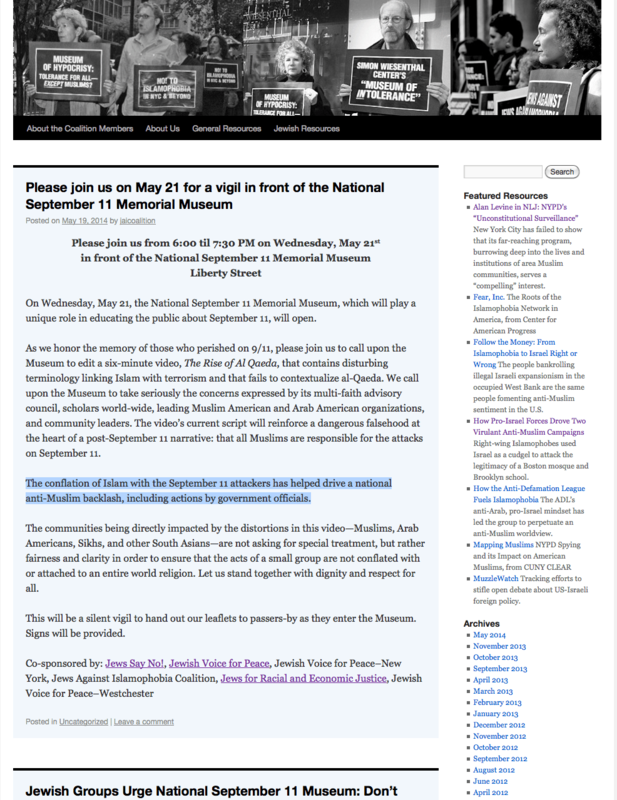 Not a place to hand out flyers accusing the Memorial Museum of anti-muslim bigotry. Nevel finally gave the order to walk quietly to Greenwich S. To do their protest on the PUBLIC street which borders the Memorial on the East. However, as soon as they turned towards the street….not yet ON the street…the good little soldiers WHIPPED out their posters and held them high for the salivating photographers. A photo-op that was happening ON the Memorial Grounds with the Falls and Museum in the pictures. NEVER let ANY media opportunity go to waste. 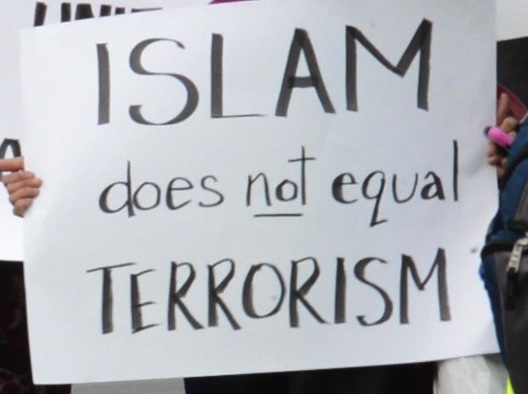 Some of the muslim participants were held signs meant, it would seem, for the Jewish participants of “Jews for Peace” and “Jews say No”. And those oh-so-important flyers, I usually find a few in the trash. But, for obvious security reasons there was a paucity of trash cans in this area. Their website statements posted up top will have to do. And interviews for the Foreign Press … I caught most of Todd Fine‘s interview on-camera. In conclusion, the PUBLIC wasn’t very interested in this circus side-show. Just the sycophant press. Lapping up their fiction. Ignoring the real story. 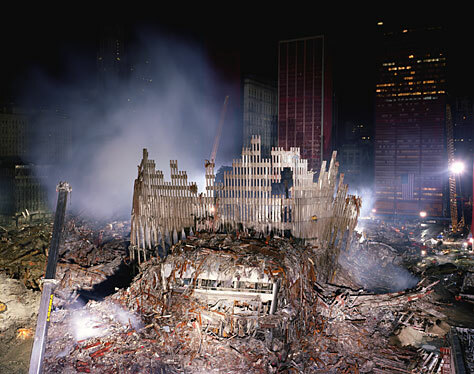 Almost 3,000 people were murdered on 9-11. Murdered by muslim Terrorists. Religious muslims, who made sure the world knew they murdered 3,000 infidels because of their religion. This entry was posted in current events and tagged 9-11, ground zero Museum, protes. Bookmark the permalink. As someone who saw the film, and a tolerant person, there is absolutely nothing that needs to be cut from the film. It portrays nothing but facts and actual history. Do not water down what happened!! their horrific act not the victims. I’ve bookmarked it and pass it on to others. Thanks so much. Glad to meet you.